While hunting for some fun challenges to enter, I ran across the Simon Says Stamp Flickr challenge that wants something that makes you think of summer. Besides Lemonade, June always makes me think about June brides. 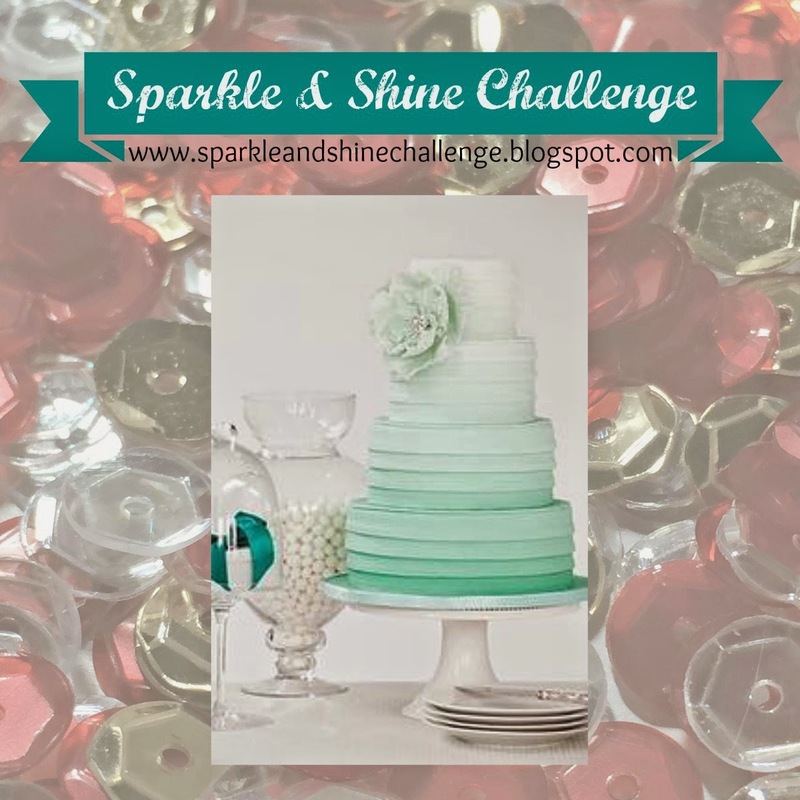 Though I probably would have used a color besides green for my ombre wedding card, the good people at Sparkle and Shine Challenge have a photo inspiration and their wedding cake is green, so I just went with it. 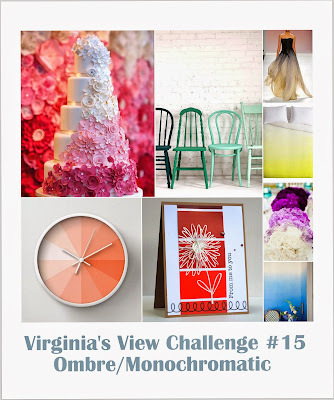 This card also qualifies at the Virginia's View Challenge with the ombre background. After I was finished putting the card together, I decided I quite like it. That wonderful background weave is a new folder by We R Memory Keepers. A die cut doily, a little stamping, some thread and sequins finished the wedding card. I tend to give more elegant cards for weddings, but for a fun beach wedding, this would be perfect! That's one fantastic ombre inking and I just had to stop by for a closer look. Stunning card. I think any couple would be happy to receive this card, regardless of the venue. ^_^ That's something you could do over and over again, in the bride's colors too. Thanks so much for sharing. Gorgeous card Penny! I love that basket weave background! That sentiment is so funny! Thanks for playing along with us at Scrapy Land Challenge #19! That sentiment is hilarious! Love your ombre! Fabulous ombre and the basket weave background is so beautifully textured. 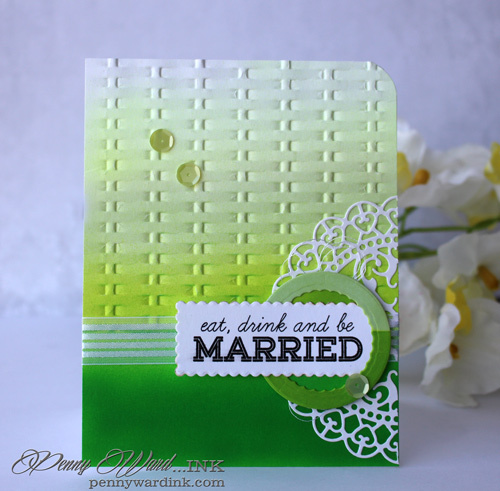 Beautiful ombre and I love the embossed background! Thank you for playing along with us at Sparkle & Shine! Wow! 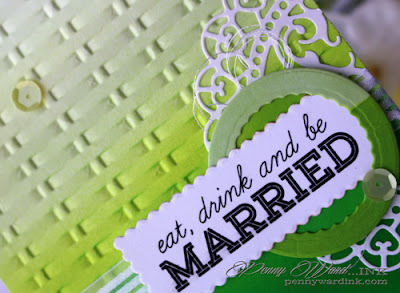 I love the ombre shades of green and that basket weave embossing folder is making me drool! What a fantastic card, Penny! thanks for joining us at Scrapy Land Challenge! The colors are to die for and the styling of this card is so cool and fun!! Love that texture in the background on the top of this beautiful and fun simmer wedding card!!! WOW! !